In the middle of your shift, suddenly things calm down and you realize: I’m hungry. So you survey the options: A.) the vending machine (too unhealthy, to say nothing of unappealing); B.) the thank-you box of cookies made by a patient’s well-meaning spouse (too fattening and too full of sugar…and will end up sapping what energy you have left); and C.) snack du jour from the cafeteria (too time-consuming and not exactly great gourmet fare). Inevitably you end up with choice A or B, feeling guilty or dissatisfied (or both! ), and wishing you had thought ahead to bring something from home—not just anything, but something delicious. With a little planning and a few minutes for assembly, there’s no reason why you can’t enjoy healthy snacks on the job. The 110 fixings that follow go way beyond the standard carton of yogurt or energy bar, making it far less likely that you’ll be derailed by the donuts that show up at your station. Even the options here that may seem like a splurge are acceptable because they’re small. 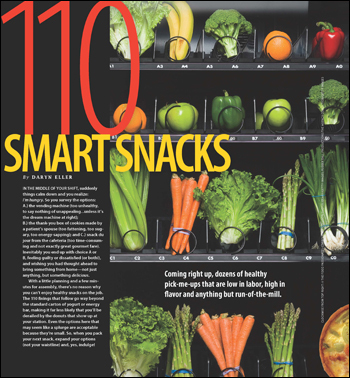 So, when you pack your next snack, expand your options (not your waistline) and, yes, indulge!